Question: What recommendations do you have for teaching transfer students? For example, how do you determine what level they are at? How do you determine what method to use and where to start in that particular method? Okay, so I’m a complete Broadwayphile. But stay with me here. Teaching transfer piano students is something that most of us come across at some point in our piano teaching career. When dealing with transfer piano students, it’s a delicate balance between resisting the urge to scrap everything and start from scratch vs. limping through a method book and teaching regimen that is as foreign to you as Siam (Did you get it? I’m quite proud of that segue!). Every piano teacher has their own unique way of teaching… and our piano students carry our stamp of teaching with them wherever they go. So how do we, as the new piano teacher, continue their piano lessons without driving ourselves (or the student) crazy? … Hammerstein has the answers. You and your transfer piano student have a lot of catching up to do! It’s important to start your teaching relationship with as much background information as you can get your hands on. Ask your student to bring all of their old piano books (as far back as they can) to their first lesson. By flipping through their early method books you’ll get a good idea of their former teacher’s style. However, still spend some time with your piano student talking about topics such as: how they are used to approaching a new piece, the length of time they are used to playing a piece, how much review they typically did and what kinds of pieces they enjoyed the most. You’ll get a good read from their old books on how their former teacher approached these topics, but it’s also good to get your new piano student’s take. 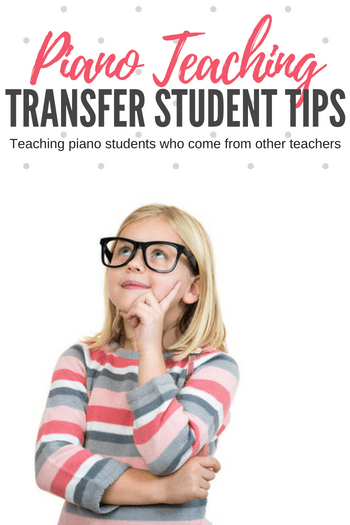 One of the most important things to consider when beginning lessons with a new transfer piano student is how you will go about building a strong teacher/student relationship. It can be a bit of a rocky road in the beginning; they’re getting used to you and your ways, you’re getting used to theirs. They’ll may miss their former teacher… or could possibly have had a negative experience with piano lessons in the past. Having a common ground of mutual trust, respect and (hopefully!) friendship is paramount. Take a genuine interest in their out-of-piano life. Have a good sense of humour. Be the piano teacher they’ll wish they began with in the first place! One of the best relationship-building activities is to play a piano game with your student. Not only can you quietly get a good read on what they do and do not know, but you can have some fun, share some laughs and show them the unique and fun materials they can look forward to using with you! Check out PianoGameClub.com to start building an incredible piano game library. If you are going to have a long and prosperous future with this student, it is important that you are free to teach the way you teach. Attempting to continue their piano education in the same vein as their former teacher can only work for so long. It’s best to quickly establish their level (sight reading is a great way to find out their strengths and weaknesses pretty quickly, but you will also have seen their method book history) and then switch them into the method book series that you are used to using. It’s okay to take a few steps back in terms of difficulty or level when switching into a new method book (so starting at the beginning of the appropriate book is just fine). Your student will have time to adjust to your new teaching methods without being too stretched by the repertoire… and, you’ll have the opportunity to undo any habits that you find don’t fit with your teaching style. Be considerate of their ego when introducing the new method book. A student who is used to being in Level 4 of one series and who is suddenly placed in Level 2 of another will need a careful explanation of how the methods are different.